When I was in Dallas recently, I met Kevin Vela, one of the founders of the Vela | Wood law firm. He told me about the Venture Deals Review podcast that he had done with his associate Aaron Terwey. The podcast is 19 episodes, each about a half hour, going through the chapters of Venture Deals: Be Smarter Than Your Lawyer and Venture Capitalist, 3rd Edition. I listened to the first few episodes on my long run in Big Sky on Saturday. They were great and it helped me grind through the last half of a 2.5 hour run in the snow and cold. Take a look at the overview of the Venture Deals Review podcast or just head over to iTunes to subscribe to Office Hours with Vela Wood which includes the Venture Deals episodes as well as some other good stuff. Kevin and Aaron – thanks for doing this! I’m in Boston today, so was fun to see Venture Deals make the list from Boston University Questrom School of Business of Top 7 Books for Innovators to Read in 2019. It’s cold and icy here, so this warmed my heart a little. It was fun to see Venture Deals on the most recent Fortune Term Sheet Ultimate Business Book List. It’s a pretty awesome list. I’ve read most of the books on it and just bought the few that I haven’t yet read. With the publication of the third edition of Venture Deals, we have done some interviews around the book. I thought this one with Chicke Fitzgerald on The Game Changer Network was particularly good. Fred Wilson has a spectacular post up on how VC funds should think about reserves. It’s even more valuable to entrepreneurs so they can understand how the best VCs think about reserves, giving the entrepreneurs ammunition to ask their investors how they are thinking about reserves. I only noticed one thing missing from Fred’s post which is a statement about cashflow which I commented on. In addition to the post being great, the comments have a lot of rich stuff in them as well. Scott Belsky has a great post up titled Don’t Get Trampled: The Puzzle For “Unicorn” Employees. In it, he’s got a bunch of questions, along with detailed discussion, that you should ask your potential employer if you are considering a job at a unicorn (company with > $1b private valuation.) His suggestion is to strongly “audit your comp” in advance. Have you raised capital with liquidation preferences, and what are they? How many months of runway do you have? If you need to raise more money but are unable to do so at standard terms, will you accept less favorable terms or will you raise at a lower valuation? Has the company taken on debt? Does the company aspire to be a public company? If the company’s plan is to stay private for the foreseeable future, have there been secondary sales for employees and/or founders? Have the company’s financials been audited? I encourage you to read the whole post at Don’t Get Trampled: The Puzzle For “Unicorn” Employees. 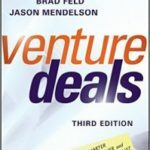 Venture Deals: Be Smarter Than Your Lawyer and Venture Capitalist is the definitive guide to venture financings. This book is for anyone who wants the insider’s guide to raising money, negotiating deals, and to know what really makes venture capitalists tick. Today’s great post is from Bilal Zuberi @ Lux Capital. In it he asserts that Friends Don’t Let Friends Have a Lazy VC/CEO Relationship. I see this play out so many times in so many ways that – while it seems obvious – it’s an important reminder to all entrepreneurs who hear their friends complaining about their relationship with a VC. I love it when David Hornik – one of the very first (maybe the first) VC bloggers writes a post. Today’s is Want to get funded? Get an introduction! So simple, yet so often overlooked or ignored. So how do you get funded? Step one — get an introduction. Find someone you know who can introduce you to the person you want to pitch. The closer your relationship with the person making the introduction, the better. And the closer that person’s relationship with the VC the better. I’ve written about this before and described it as “borrowed credibility.” If you are being introduced by someone who has credibility with the VC, and you have credibility with the person making the introduction, you will have credibility with the VC. And as a corollary to the traditional transitive property, (1) the stronger the credibility between A and B, and (2) the stronger the credibility between B and C, (3) the stronger the credibility between A and C.
If you don’t follow VentureBlog, you should. It’s the original.